China Mengniu Dairy Company Limited and its subsidiaries manufacture and distribute quality dairy products in China. It is one of the leading dairy product manufacturers in China, with MENGNIU as its core brand. 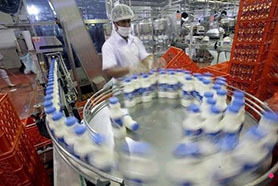 The Group’s diversified products range includes liquid milk products, such as UHT milk, milk beverages and yogurt, ice cream and other dairy products such as milk powder. Mengniu’s liquid milk products ranked first, in terms of sales volume and sales value, among similar products in China in 2012, according to China Industrial Information Issuing Centre.